Three words I would use to describe this soup: simple, nutritious and satisfying. It’s a recipe I’ve been sharing with clients and making at cooking lessons for ages. Most recently I made a batch and shared a photo in my Instagram stories and I received so many requests for this recipe! So here we are! It’s officially live on the blog. Just a few notes before diving in! Firstly, I used swiss chard this time around, but I’ve also used kale and collards with great success. I also strategically included turmeric and ginger as I’m always trying to find ways to incorporate these anti-inflammatory superstars into my cooking. I must mention that while this is a soup, it really does hold up as a meal on its own. Between the red lentils and quinoa, you’re getting a really nice portion of plant-based protein. The complex carbohydrates from the potatoes will keep you full longer. Plus, it’s a one-pot wonder and it freezes well. Wins all around with this soup! Scroll down to get the full recipe! If you try it out, please let me know. I truly appreciate getting your feedback on my recipes. Warm the oil in a large pot over medium heat. Sauté the onions, carrots, celery and chard stems until tender, about 8 minutes. Add in the minced garlic and sauté another minute, just until fragrant (if using fresh ginger and/or turmeric add it with the garlic). Add in the cumin, dried ginger, dried turmeric, salt, potatoes, lentils, quinoa, water and bring the soup to a boil. Once boiling, lower the heat and cover the pot to let everything simmer until the lentils are tender, about 20 minutes. Once the lentils and vegetables have softened, stir in the chopped chard leaves and cook until they are wilted, just a few minutes. Season with additional salt, if desired, and serve warm with freshly ground black pepper. If you like a little heat, try adding chili flakes or a hot sauce of your choice. Leftovers can be stored in the fridge for up to 4 days or frozen for about 2 months. If you enjoyed the recipe I shared above be sure to check out my Plant-Based Breakthrough program, which is a 4 week online crash course in health, nutrition, and meal planning. For details on when the next program starts click here. You can also join the Plant-Based Breakthrough Community on Facebook where I share recipes, inspiration, and information on plant-based nutrition. Before I even dive into the recipe, I should probably tell you a little about tempeh. Maybe you’ve seen it but have been intimidated to try it, or maybe you’ve never even heard of it before. Either way, tempeh is becoming more and more popular, but I wouldn’t say that it’s a mainstream staple yet. So what exactly is it? Tempeh is a plant-based protein. Like tofu, it’s made from soy beans, but the taste and texture is very different due to the way it’s prepared. Unlike tofu, tempeh is a fermented food. It’s a staple in Indonesia and it’s slowly making headway among vegans, vegetarians and flexiarians everywhere. I enjoy cooking tempeh in many ways. I love cutting it into small cubes, marinating it in a peanut ginger sauce, and baking it in the oven. I also make a smokey tempeh “bacon” by coating the tempeh in a maple, tamari and smoked paprika marinade. It can also easily be incorporated into stir-fry or added as the protein in pasta sauces, stews, soups, curries, tacos, and more! In this video collaboration with my friend Lynda you’ll learn more about tempeh and find out how I use it to make a tasty bolognese sauce. I served the sauce over zucchini noodles (to up the veg!) and topped it with plant-based cheese from Lynda’s company Fauxmagerie Zengarry. Watch our video below, or scroll down for the text version of the recipe. Grate the tempeh on the large teeth of a box grater or crumble it using your hands. Sauté the tempeh in 2 tablespoons of olive oil until browned. Add a few splashes of water if tempeh starts to stick. Add the remaining olive oil and the onion, carrot and celery, with 1 teaspoon of salt, keep cooking until the vegetables have softened. Add the garlic, oregano and basil, and cook for a few minutes longer (unless you are using fresh oregano and basil then add fresh ingredients near the end of the cooking time). Add 1 cup of red wine and simmer until almost dry. Pour in the strained tomatoes and cook covered for 15-20 minutes. Taste the sauce and season with salt and pepper and sweetener (if needed). Serve the sauce over zucchini noodles (either raw or lightly warmed in a frying pan) and topped with grated Fauxmagerie Zengarry Creamy Swiss cashew cheese. Enjoy! -See Zengarry’s website to find retailers near you. If you cannot find Zengarry in your city or town, you can always swap in another plant-based cheese of your choice, either store bought or homemade. Alternatively you could top your dish with nutritional yeast flakes to add some cheesiness or enjoy the dish on its own! Have you seen our newly revamped Canada’s food guide yet? It’s a hot topic these days and it generated a whole lot of fun discussion on my Instagram post. The new evidence based guide ditches dairy as a food group and heavily emphasizes plant-based foods. It also includes healthy habits such as choosing water as a primary beverage, eating with others, spending more time cooking at home and being aware of food marketing. Unlike former iterations of the guide, our new one highlights plant-based proteins. Speaking of which, I recently made a green curry style soup that conveniently features three kinds of plant proteins: tofu, green peas, and soy bean sprouts. This trifecta of proteins paired with homemade green curry sauce and coconut milk resulted in one of the most delicious soup I've ever created. When you scroll down, don't be alarmed by the list of ingredients. This recipe is soup-er easy to make (45 minutes start to finish), you'll learn how simple it is to DIY a flavourful green curry-style sauce, and you'll have leftovers for the next couple of days. Scroll down for the full recipe! In a blender process all of the green curry ingredients to a smooth, sauce-like consistency. You may need to add a bit of water to get things going. Warm the coconut oil in a large soup pot over medium heat. Add onion, celery and carrots, and a big pinch of salt, and cook until the onions become translucent (about 5 minutes). Add the mushrooms and cook them for a few minutes until they have softened and start releasing water. Add the green curry sauce to the pot, along with the coconut milk, tofu, bamboo shoots, and peas. You will also want to add 3 - 4 cups of water depending on how thick you want your soup to be. Bring the soup to a gentle simmer, then stir in the greens and sprouts. Cook until the greens have wilted and the sprouts have softened. Taste the soup and season with sea salt and pepper if needed. Transfer a portion of your noodles to a soup bowl and pour the green curry soup over top. Enjoy! Tofu scramble has been a staple in my diet for years and it’s definitely one of my favourite weekend breakfasts. Enjoyed on its own, or with a side of roasted veggies, a bit of salsa or guacamole, or a slice of toasted sourdough, it’s so so tasty! My friends and family love it too and I get requests for it regularly. If you’re new to the world of tofu scramble, let me tell you, this dish is a game changer. The crumbled tofu is reminiscent of scrambled eggs, and I love jazzing it up with tons of veggies and aromatic spices. Turmeric, the anti-inflammatory superstar, gives the dish a yellowish colour and nutritional yeast adds a subtle hint of cheesiness. When you read through the recipe you’ll notice I’ve listed an ingredient called “black salt” or “kala namak”. Although it’s called black salt it’s actually pink in colour. It’s not quite as salty as regular salt and it has a slightly sulphuric essence. It adds an eggy taste and aroma to the dish. I really enjoy adding it to the scramble, but it’s not necessary if you don’t have any on hand. If you want to try it out, you can usually find black salt at Indian or ethnic grocers, some health food stores, or you can order it online. I hope you enjoy this dish as much as I do. If so, please share your feedback in the comment section below and/or tag me on social media with your photos. I love to see what you’re cookin’! Warm the oil in a large skillet over medium heat. Sauté onions with a few pinches of salt, cook, stirring often, for about 5 minutes, or until they become slightly transparent. Add the peppers and sauté for a couple minutes, then add the minced garlic and cook for another minute. Stir in the chili powder and turmeric. Cook for 1 minute. Add in the mushrooms and zucchini, cook, stirring every so often, to allowing them to release water (approximately 5 minutes). Mix in the crumbled tofu. Then stir in the nutritional yeast, followed by the tomatoes and cook for another few minutes. Then add the leafy greens and cook until they’ve wilted and have become bright green. Taste and season with salt and pepper. Serve immediately and enjoy. You may wish to serve your scramble with a side of roasted potatoes, topped with avocado slices, or a few splashes of your favourite hot sauce. Keeps in the fridge for 5 days. When I made the switch to a plant-based diet many years ago, I figured my days of enjoying cheese and charcuterie boards were over. I truly assumed plant-based cheese and meat alternatives would be lacklustre. I sort of avoided these products and instead I spent a lot of time making my own cheese spreads, dips and even faux meats that were actually pretty great. However, I have to say, over time I’ve come to know and love several fantastic companies that make phenomenal plant-based cheeses and meats that not only rival traditional versions, but have made it much much easier to make the compassionate choice without having to make everything myself. As you know, I’m a huge proponent of spending time in the kitchen and learning how to make things from scratch, but I do realize that it’s not always possible especially during busy times (like the holiday season). It’s nice and so convenient to have store bought options that are healthy, delicious, and plant-based. Nowadays, it’s so easy to put together a beautiful, bountiful spread combining a variety of cheese and meat alternatives along with other components of your choosing. If you’re looking for ideas or inspiration for your next holiday party, scroll down to learn how to build your own plant-based cheese and charcuterie board. Below I share some of my favourite brands and a few healthy holiday recipes too! I partnered up with my friends at Animal Justice to make this cheese and charcuterie board. We used Fauxmagerie Zengarry cheeses and GUSTA sausage along with an assortment of other delicious things. Cheeses - Look for these brands: Daiya (Farmhouse Blocks), Culchered, Earth Island, Fauxmagerie Zengarry, Field Roast (CHAO Creamery), GUSTA, Happy Heart Vegan Gourmet, Miyoko's Creamery, Nuts For Cheese, Truffula (available in Edmonton, Alberta), Vegan Stokes, VegCheese, VegNature, and Violife. Meat Alternatives - Look for these brands: Beyond Meat, Field Roast, GUSTA, Real Fake Meats (available in Halifax, Nova Scotia), Tofurky, The Very Good Butchers, and Yam Chops. Fruits - Everybody loves grapes, berries, cherries, ground cherries, pomegranate, clementines, and dried fruits like figs, raisins, cranberries or apricots. Veggies - My favourites include olives, sliced raw vegetables, pickled or fermented vegetables (beets, onions, and gherkin pickles are always popular), roasted red pepper, roasted garlic, black garlic, etc. Nuts & Seeds - I like walnuts, pumpkin seeds, candied pecans, tamari almonds, and pistachios. Dips & Spreads - Enhance your board with a nice grainy mustard, hummus, bruschetta, salsa, chutney, jams, compotes and maple syrup. I also love this fig & olive tapenade and zucchini almond dip. Dark chocolate - Can’t go wrong here! Bread & Crackers - I like a classic french baguette and/or a mix of crackers including Mary’s Gone Crackers, Le Pain des fleurs Crispbread, and more. Decor - In the photo above, the decor includes pine cones, holly and ivy, pine branches and of course a few nice cutting boards and decorative bowls. Things like micro greens or delicate leafy greens look pretty. You can also use festive household items like mini-lights, ornaments, candles, or whatever you have on hand to jazz up your board. Many of the above-mentioned cheeses and meat alternatives are available throughout Canada and the US at health food stores, Whole Foods Markets, and most major grocery stores. In Canada, you can also order a variety of plant-based products online via Vegan Supply and Yam Chops. Did I miss anything? Tell me your favourites in the comment section below! If you’re stuck on what to make for your holiday dinner, be sure to download my Healthy Holidays eBook. CLICK HERE to get your digital copy. Special thanks to Animal Justice for this fun collaboration! Click on the image below to see a fun little video on how we built our board. Healthy Holidays eBook - Available Now! I’m excited to announce that my eBook Healthy Holidays: A Festive Feast for Veggie Lovers is now available. In my new eBook I share the recipes for a plant-based holiday feast including a hearty lentil loaf, roasted brussels sprouts, garlicky smashed potatoes, chickpea shallot gravy, and my mom's raw cranberry sauce. It also features 3 delicious vegan dessert recipes by Ana Tavares. If you’re looking for ideas for your plant-based holiday dinner CLICK HERE to download your digital copy! I recently joined forces with my friends at Zengarry Fauxmagerie to create a cooking video showcasing dairy-free holiday appetizers. You can watch the full video below or CLICK HERE to access the recipe page. If you live in Ottawa you’ve undoubtedly heard of Strawberry Blonde Bakery. Known primarily for delicious desserts, savoury snacks, and breads, behind the scenes Strawberry Blonde has been blazing the trails in plant-based and allergy free baking. A designated nut free, dairy free, gluten free bakery, Strawberry Blonde has become a fixture for those with food allergies or dietary restrictions, but since they also produce delicious baked goods, they are a unanimous favourite throughout the city. Jacqui Okum, outside of her bakery, Strawberry Blonde, in Ottawa. Jacqui Okum is the mastermind behind this award winning bakery. She has years of experience with baking and is a pro when it comes to swapping and substituting ingredients. She has been successful in “veganizing” pretty much every classic recipe. Since the holidays are synonymous with baking (baking, and more baking!) and many of you are likely planning to adapt classic recipes to make them plant-based, I hope to ease this process by learning from one of the best bakers around. Below Jacqui shares her story about starting a vegan bakery, gives us insider tips, tricks and swaps for plant-based baking, and also shares her recipe for Magic Cookie Bars. Yum! Scroll down to learn more. Amy: Strawberry Blonde is one of Ottawa's most beloved bakeries. Were you always into baking? Jacqui: I was definitely always into eating baked goods! Haha! I originally went to University for Film Production and worked in the TV industry for a number of years. I eventually decided it wasn't the right work environment for me and around the same time I went vegan. The transition to being vegan was easy, but boy oh boy did I miss pastries and sweets. Vegan pastries were hard to find then (about 12 years ago now) so I just ended up baking all the time for myself. I found I really liked it. And although I knew I didn't want to work in Film/TV, I didn't know what else I wanted to do. I did know that I wanted to be my own boss. One day my boyfriend made an offhand comment about how I should open up my own vegan bakery since I was just baking all the time anyway, and when he said that, it was like a lightbulb went off in my head. I decided that if I was going to do it, I wanted to do it right so I enrolled in George Brown College's Baking & Pastry Arts Program, where I learned all the tips and tricks of the trade and applied them at home to vegan baking. Amy: When did you open the bakery? And what inspired you to offer vegan, gluten free, & nut free baked goods? Jacqui: The storefront on Grange Ave opened just over 5 years ago now. But we were baking for wholesale customers (Rainbow Foods on Richmond Road and Herb & Spice on Bank street) for a number of months before that. And before that even I was selling my baked goods at the Lansdowne Farmer's Market. My treats were always vegan, but it was my experience at the market that made me decide to switch to doing everything gluten free and nut free. I really listened to my customers and the majority of them were asking for gluten free or nut free on top of it being from from dairy and eggs. For allergy concerns, I thought it would be best to just eliminate these ingredients completely, to avoid risk of cross contamination. But also, being vegan, I really sympathized with them, knowing how disappointing it can be to not be able to enjoy a pastry or a treat. I quickly became determined to create a space where vegans, or those with allergies, could go and feel normal and have the ability to get excited the way most people do when treating themselves. Amy: Many of my readers are interested in transitioning to a plant-based diet and looking for tips, swaps and alternatives for baked goods. Can you share a list of swaps/alternatives that you use in creating your famous desserts? -I find Earth Balance to be the best and most consistent brand for replacing butter. It can easily be used as a 1:1 ratio when subbing in any recipe. -There is a soy-free brand of butter replacement called Melt that is good for some things, but it is more expensive than Earth Balance and the ratio needs to be played with a little bit. But if you're looking for soy free, this is a good alternative, especially for making icings. -There are so many milk alternatives out there and they all work fairly well with a 1:1 ratio. I find soy milk to be the creamiest and works best in most situations. Coconut milk is also good, but the fat content is higher so it sometimes separates or makes products a little greasier. -For butter milk, simply add 1 tsp of vinegar or lemon juice per cup of milk and whisk. Let it sit for a couple minutes then it's turned into buttermilk. -The tofutti brand is by far the best for baking! Amy: Finally, we're getting into the holiday season. Would you mind sharing one of your favourite seasonal recipes? Jacqui: Sure thing! The Strawberry Blonde Magic Cookie Bars are a serious Christmas favourite for both our customers and staff alike! Line a 9"x 13" pan with parchment paper. Melt the Earth Balance and combine with graham cracker crumbs and sugar. Press firmly and evenly into pan. Pour chocolate chips evenly over base, making sure to cover the corners. Pour hot coconut milk/sugar mixture evenly over the top of chocolate chips, followed by an even layer of coconut and pumpkin seeds. Press ingredients down with your hands or a spatula. Bake for 25-30 minutes or until set and top browns slightly. Let cool completely, then put in fridge for at least 2 hours to make cutting easier. Enjoy! For more information about Strawberry Blonde Bakery, visit their website, Facebook page, or Instagram account. I’ve always been a little bit obsessed with cheese, so when I went dairy-free many years ago I had to find new ways to indulge in my favourite food. Cashews tend to be the superstar when it comes to making cheesy alternatives, but you’d be surprised how tofu can magically morph into feta if you’ve got the right ingredients. In my version of tofu feta, I use two ingredients that help infuse a cheese-like flavour into the tofu. Firstly, there’s nutritional yeast, which is a deactivated yeast and bi-product of molasses making. Nutritional yeast or “nooch”, as it’s often called, is a staple in dairy-free cuisine because of its versatility and sharp, cheesy taste. I also used miso paste, which is fermented bean (generally soy or chickpea), that is mostly found in Japanese cuisine and offers a strong and pleasant salty fermented taste reminiscent of parmesan (but it works with perfectly with my faux feta). I use both in my recipe, however, you could get away with one or the other. That said, if you’re delving into the world of dairy-free cooking, they are handy and highly recommended pantry staples. If you have questions about any of the ingredients in this recipe, don’t hesitate to ask in the comment section below. If you’re looking to learn more about dairy-free cuisine, I’ve written a few blogs on the topic. Find them HERE and HERE. A final tip about tofu feta: you can definitely serve it with salad as instructed below, but it can also be crumbled onto vegan pizza or eaten as an appetizer with tomatoes and fresh basil. This recipe has been very popular at my cooking lessons and I’m super excited to share it here on my blog for you to try as well. Without further ado, scroll down for all the details. Please do report back if you try this recipe! Drain and press the tofu for at least 30 minutes. You can wrap the tofu in a dish towel and place a heavy object on top (I often use a cast iron pan with a big jug of vinegar, but you can use any heave object in your kitchen) or use a tofu press. While the tofu is pressing, whisk together the miso, extra virgin olive oil, water, nutritional yeast, oregano, garlic powder, salt and pepper. Cut the tofu into small cubes and toss with the marinade. Place in the fridge and marinade for an hour, preferably longer. If you have time, leave it to marinate overnight. Whisk together the dijon mustard, garlic clove and lemon juice until combined. Slowly whisk in the olive oil until combined. Season with salt and pepper. Divide the salad ingredients evenly in bowls. Top with tofu feta and drizzle on dressing. Serve immediately. If you want to prep ahead of time, wait until just before serving to add the dressing. Notes from the kitchen: I used a locally made navy bean miso (as seen in the photo above), but you'll be more likely to find a white miso or chickpea miso in a store near you. It's been a long time coming and I'm happy to finally be posting my chickpea salad recipe! I've made it for cooking lessons, yoga retreats, and shared with many of my clients, always with such positive feedback. It's truly one of my favourites and I was so excited to learned that Ana Tavares, my friend & photographer extraordinaire (she shot the photos below), makes this recipe often for her son's lunches. Given that I've received so many requests for easy back-to-school/kid friendly recipes lately, the timing couldn't be more perfect! This recipe is nut, dairy, egg, and gluten free, and offers tons of plant-based protein and fibre. It's also a versatile recipe that can be eaten on its own, in wraps, sandwiches, with crackers or on a bed of leafy greens. For this blog post, I opted to serve it in a wrap because it made for fun food styling. You'll notice this recipe calls for dulse or kelp flakes. These are both varieties of dried seaweed ground into flakes, which can generally be purchased at health food stores or online. Although I've listed these ingredients as optional I highly recommended adding seaweed since it's such a nutritious food and gives the chickpea salad a nice boost of flavour (reminiscent of tuna ...but less fishy). Scroll down for the recipe and please let me know if you have any questions or feedback. I love hearing from you! For a chunky consistency: add all of the ingredients (except dill) into a medium sized bowl. Mix and mash everything with a fork or potato masher. For a smooth consistency: add all the ingredients to a medium sized bowl and process with an immersion blender. Alternatively add the ingredients to a food processor and process until smooth. Once desired consistency is reached, stir in the dill. Enjoy in sandwiches, wraps, on crackers, or on a bed of salad greens. Keeps in the fridge for 5 days in an air-tight container. Since starting my business I've been forced to learn (and unlearn) so many things and create new habits to help manage my ever-changing schedule. I've never been an organized person, in fact, I was probably the opposite of organized, and starting a business was a big wake-up call for me. Somebody once told me that a cluttered space creates a cluttered mind. That really stuck with me. Over the last couple years I've slowly been working towards tidying up in various aspects of my life. Like anyone on the quest for less clutter I've read Marie Kondo's book The Life- Changing Magic of Tidying Up: The Japanese Art of Decluttering and Organizing (I highly recommend it, by the way) and I've been applying her principles. Most recently, I even won a contest which included a session with home organizer Kelsey Marion. Kelsey is an easy-going, yet professional and completely non-judgemental lover of all things organization. She runs the business Get Sorted. Organizing is a pain point for me, but for Kelsey it's a passion. Since our initial visit she's been to my house several times and whenever she leaves I feel lighter, less stressed and definitely more in comfortable in my living space. I truly believe that living and working in an environment that feels good is important for physical, mental, spiritual wellbeing, not to mention creativity, productivity, and so on. That doesn't necessarily mean a tidy, decluttered space is the answer for everyone, but for me personally, I felt overwhelmed by my surroundings and that's why meeting Kelsey was so serendipidous. Kelsey and I have spoken at length about organization and tidiness, and she has also taken some time to share her insights for my blog. Read on to learn more about Kelsey, the connection between decluttering and health, dealing with clutter related stress and quick tips for organization. Amy: What drew you to organizing and ultimately starting your business? Kelsey: I used to be a disorganized person - across the spectrum; in school, financially, socially, work. I collected many items that were not serving a purpose in my life. I didn't recognize how my disorganized behaviors were negatively affecting my life until I was in University. I really became frustrated with myself and knew I needed to unlearn my behaviors/habits. After years of self reflection and research of decluttering and realistic organizing techniques that would benefit me I felt a huge weight lifted. After feeling this great I knew others would feel amazing too. Get sorted was formed out of the desire to help others reach their organizing goals and it's been a rewarding experience ever since! Amy: Is there a connection with an organized and decluttered space and a healthy mind & body? Kelsey: Yes!!! When we are living in clutter we cannot focus at our fullest potential. By reducing the clutter to items that actually make sense for your life we have the space to make positive changes and/or form routines in our lives. We are not wasting time digging through clutter to find items. By decluttering and being more organized we reduce feeling overwhelmed by the mess (less mess = less stress). I find when a kitchen is more organized it is more inviting to cook in. Overall, it enhances the chances to feel less stressed or guilty, and more room to function and motivated to make healthier choices. Amy: Clutter and mess can feel overwhelming. Do you have tips for getting over the initial stress of tidying? Kelsey: Do not try to do everything at once! For example, "I want to organize my entire home today". This will only make you feel overwhelmed and discouraged. Take it one cabinet/ dresser/ closet at a time. Create realistic goals for yourself, especially if you are doing this on your own. If you're at the point of complete overwhelm, I highly recommend hiring a professional organizer to book a consultation to explore your options. Amy: Can you share a few organizing tips that my readers could practice on a daily, weekly or monthly basis that'll make it easier to keep their space organized? • hang your coat on the rack or hang up instead of throwing on floor. • empty your kid(s) lunch bag after school/ camp instead of leaving dirty containers and wrappers overnight. Little actions like this help maintain order in your life. You don't need to have a "show-room" space 24/7; I tell my clients you want realistic goals. As long as the home feels functional to maintain that is the ultimate win! Want to connect with Kelsey? Visit her website or find her on Instagram and Facebook. This summer heat just won't quit. We've got another hot week ahead here in Ottawa, which means I'm avoiding my stove, my oven, or anything that'll heat up my house. If you're looking for a no-cooking-required simple summer recipe, you're in luck. You may have seen a raw taco bowl on my blog before, but it's making a comeback. I've simplified the recipe and collaborated with my friend Ana Tavares to shot some beautiful photos. This recipe has been on high rotation at my cooking lessons this summer and is also a favourite in my household. Ana told me her family also loved the bowls as they were the lucky recipients of the leftovers following the photoshoot. Scroll down to get the full recipe. Please let me know if you've tried it out. I'd love your feedback! If you're using sun-dried tomatoes in oil skip this step. If using sun-dried tomatoes (just dried tomatoes and salt, no oil), add them to a bowl and cover them in water and leave them to soak for 1 - 2 hours to soften them. Drain. Process all of the Walnut Meat ingredients in a food processor until well combined, but still chunky and crumbly (with a meaty texture). Combine all of the Tahini Sour Cream ingredients in the blender and process until smooth. If it's too thick, add some water to loosen. To assemble your salad: place about 2 cups of leafy greens in a bowl. Top the salad with the fresh tomatoes, a sprinkling of red onions and green onions. Then add the walnut meat and drizzle about 1/4 cup of dressing on your salad. Garnish with cilantro and enjoy! If you enjoyed the recipe I shared above be sure to check out my Plant-Based Breakthrough Program, which is a 4 week online course focussed on health, nutrition, meal planning, and cooking. For details on when the next program starts click here. You can also join my Plant-Based Breakthrough Community on Facebook where I share recipes, inspiration, and information on plant-based nutrition. It's turning out to be a hot, hot, hot summer, and if you're looking to beat the heat, I’ve got just the recipe to cool you down. Cherry Chocolate Nice-Cream. Need I say more? Well, perhaps I should clarify for those of you who are new to the term "nice-cream", which is a quick DIY dairy-free banana-based ice-cream. It's essentially the easiest, tastiest and possibly healthiest way to make ice-cream at home. I’m super excited to share this recipe for a couple reasons. Firstly, I’ve been making this one a lot at my cooking lessons and sharing photos on my Instagram stories. Needless to say, I had lots of requests and it's about time I share this with those of you who haven't been able to attend the lessons. Secondly, this is the first of many upcoming projects that I'll be doing with my friend Ana Tavares. You might remember seeing her as a guest blogger, or perhaps you’ve stumbled upon her Instagram where she posts stunning food photography. If you speak Portuguese you may have discovered her vegetarian food blog or cookbook (which has been hugely successful in Brazil). Ana took the photos for this post and we plan to collaborate in the coming months to create more great culinary content in both English and Portuguese. Scroll down to learn how to make Cherry Chocolate Nice-Cream and stay tuned as we’ll be sharing another recipe collab next week. Chop the bananas into small rounds and freeze them overnight on parchment lined baking tray. Add all ingredients - except cherries and coconut flakes - to a food processor or high-speed blender. Process until completely smooth (similar to a soft serve consistency). If you find your blender isn’t strong enough to handle the frozen banana you may need to let them thaw a bit and/or add a bit of non-dairy milk to get things going. Once you've reached a nice, smooth texture, add the cherries, then pulse for a minute or so or until the cherries are evenly distributed, but still a bit chunky. For the best texture you’ll want to enjoy your nice-cream immediately, but you can freeze leftovers and thaw again before serving. When serving, top your nice-cream with whole frozen cherries and unsweetened coconut flakes. I've been making tons of Green Power Bowls these days. These have been very well received by my private clients and at cooking lessons. I have been posting photos of these bowls a lot in my Instagram stories and I figured it was finally time to share the recipe on my blog. Although it may seem elaborate, these kinds of bowls are actually quite easy to make. It requires a little prep, chopping and sautéing of the veggies, putting together the dressing, and making the noodles. If you are a soba noodle newbie you'll want to pay attention to a few things. Pure buckwheat noodles are gluten free, but you may come across some varieties of soba noodles that are a mix of buckwheat and wheat. The blended variety is much less expensive. If you are celiac or gluten intolerant make sure you seek out the 100% buckwheat noodles. When using buckwheat noodles of any kind, I always cook them according to the package directions (usually for about 5 - 8 minutes on a simmer). When they are fully cooked I transfer them to a colander immediately and give them a very good rinse under cold water. This will remove any excess starch. By the way, if you don't have soba noodles on hand or if you don't want to use them, you can also swap out the soba noodles for rice noodles, quinoa, or any other grain or noodle of your choice. I also wanted to mention that this recipe is really a guideline. As I said above, you don't need to use soba noodles, you can use something else. Also, feel free to swap in kale for spinach, or maybe some bok choy. You may also decide to add in chickpeas or tofu instead of the edamame. The sauce is the pièce de résistance and no matter what you put in your bowl, it'll taste good as long as you're using the sauce. Scroll down to get the full recipe and if you make it, please tag me on social media. I love seeing your photos! Wash and chop cauliflower & broccoli (approximately 6 - 8 cups in total) into bite sized pieces. Wash spinach and pat to dry or use salad spinner. Pick basil leaves off the stems (discard stems), wash leaves, and gently pat to dry. Set aside. In large measuring cup or medium sized mixing bowl, combine all the sauce ingredients, except the water. Stir until well combined (you could also use a blender if you're looking for a very smooth sauce) and add enough water to thin the sauce down so that it’s pourable. Set aside. Cook noodles according to the package. Drain, rinse, and toss with sesame oil. Set aside. Warm the sesame oil in a wok or skillet over medium heat. Add the green onions and cook for a couple minutes, just until they start to soften. Add the heartier vegetables - cauliflower & broccoli - cook until tender. Add the edamame and warm for a minute or two. Add the spinach and basil towards the end of cooking and allow them to wilt (about 2 minutes). To create your bowls: add a portion of soba noodles and a big scoop cooked vegetables to a bowl. Top your bowl with a drizzle the sauce. Alternatively, you can add the sauce to the pan with the vegetables to heat the sauce. Before serving, top with a sprinkling of hemp hearts and any remaining green onions. These bowls can be eaten warm or cold. As you may already know, I'm a huge proponent of plant-based foods. Plants offer a wide variety of vitamins, minerals, macronutrients and phytochemicals, all of which support a multitude functions within the body. So eat plants, and eat lots of 'em. Your body will thank you! The list below includes my top five foods (or groups of foods) and I truly make an effort to consume all of them regularly. Not always every day, but it would be rare for a week to pass without these foods turning up in my meal planning. I hope you’ll be inspired and add these items to your next grocery list. HEMP HEARTS. These are, pardon the pun, very dear to my heart. I really do love them! A true Canadian super food, hemp hearts are grown and cultivated in Canada. They are an excellent source of protein containing all 9 essential amino acids and essential fatty acids (omega-3 and -6). Fun fact: the varieties of hemp that are grown for food purposes naturally help to suppress weeds, meaning that no pesticides or herbicides are required to grow hemp successfully. How to use them? I like to sprinkle hemp on my morning oats, on top of avocado toast and soups. I add them to smoothies and add into salads, including my Superfood Kale Salad. PULSES. So technically pulses would be considered a grouping of foods but I just love them so much that I had to include the whole family. The term pulses refers to a category of dried edible seeds under the legume umbrella and includes chickpeas, split peas, lentils and beans. Pulses are very high in protein and fibre, and are low in fat. Pulses provide substantial amounts of vitamins and minerals including iron, magnesium and zinc and are abundant in B vitamins. A great way to start playing around with pulses is to use them in my Middle Eastern Lentils & Rice with Caramelized Onions, Butternut Squash & Red Lentil Soup or Beet Hummus. LEAFY GREENS. I’m the queen of leafy greens. They are my life blood. When I first realized I was allergic to cow’s milk and stopped eating all dairy products, I was surprised to learn that leafy greens — like kale, spinach, and collards greens — are a great source of calcium. Who woulda thought? If you are new to eating leafy greens, I recommend trying out different varieties and cooking methods. For example, some people prefer baby kale over full grown kale which tends to be very fibrous and bitter. Also, cooking leafy greens can soften them up nicely and make them more palatable, especially if you’re not used to eating bitter foods. To get you started, I recommend trying out my Sautéed Garlicky Greens recipe. SEAWEED. Now, I realize seaweed is not for everyone. However, if prepared properly even biggest seaweed skeptic may grow to love 'weed! Trust me, I’ve been successful in turning seaweed haters into seaweed super fans with my recipes. What I love about seaweed is that it's a very sustainable crop. Think about it, seaweed doesn't requires land, water or fertilizers to grow. On top of that, seaweed is a very, very nutritious food. Seaweeds are rich in iron, vitamin C, and iodine and are also an excellent source of dietary fibre. My personal favourite variety of seaweed is dulse, but I’m also a huge fan of kelp, nori (aka. sushi seaweed) and hana tsunomata. If you want to dive deeper into seaweed I’ve written a more detailed blog post on the topic. As for recipes, I recommend my Dulse, Sunflower Seed & Walnut Pâte. FLAX SEEDS. Grown here in Canada, flax seeds are an amazing source of fibre and anti-inflammatory omega 3's. They are great for weight management, heart health, reducing inflammation, and much more! To take advantage of the anti-inflammatory benefits, you'll want to consume ground flax seeds. You can buy the flax seeds ground or whole. If you buy them whole you can grind them yourself in a high-powered blender or spice grinder. Add ground flax to your morning oats, in smoothies, or as a topper for my Buddha Bowls. If you've never had flax before, you should start with small amounts (about a teaspoon). Because of its high fibre content, a little flax goes a long way! 💩 Quick storage tip for you: I recommend storing both whole and ground flax in your fridge or freezer to maintain freshness and the integrity of the omega 3 fatty acids. If you enjoyed the information I shared above be sure to check out my Plant-Based Breakthrough Program, which is a 4 week online course focussed on health, nutrition, meal planning, and cooking. For details on when the next program starts click here. You can also join my Plant-Based Breakthrough Community on Facebook where I share recipes, inspiration, and information on plant-based nutrition. Seaweed has become more and more popular these days. It has been featured in prominent and well respected blogs, magazines, and media outlets as a top food trend, and chefs around the world are finding new and exciting ways to incorporate seaweed into their menus. It's also been touted for its many health benefits and is a rising star in the world of sustainable foods. Seaweed is an umbrella term for an entire group of macroalgae and microalgae that live in salt water, brackish water, or fresh water. There are three main varieties of seaweed: Green algae, such sea lettuce. Brown algae which includes kombu/kelp, wakame, arame, and hijiki. Red algae includes well-known varieties such as nori, dulse, and hana tusnomata just to name a few. Depending on the variety of seaweed, it may be harvested wild or using various cultivation systems (seaweed farming). Cultivation can occur onshore using large tanks, inshore (close to land), or offshore (in deeper waters). In some cases it may be handpicked, collected using nets, or harvested mechanically. When it's harvested seaweed is processed immediately to avoid spoilage. Generally seaweed is rinsed with clean salt water (fresh water is damaging to seaweed) and dried in the sun or using drying equipment or facilities. Once dried, seaweed is vacuum sealed to prolong freshness and quality. Cultivating sea vegetables in the oceans may offer the environment healthy benefits through reducing ocean acidification and purifying the water around them. Cultivation is also sustainable as it reduces the risk of over-harvesting wild species, and it is a food source that does not require feed, fertilizer, or land to grow. Taylor Widrig, owner of Mermaid Fare, harvesting kombu in Nova Scotia. Seaweed is an extremely nutritious food. It's rich in vitamins and minerals that are easily absorbed by the body. It also contains antioxidants, is anti-inflammatory and contains essential fatty acids and essential amino acids. Depending on the variety, seaweed can contain anywhere from 5 to 45 % protein. It also contains a significant amount of dietary fibre (anywhere from 30 to 60 % when dry) and omega 3 and omega 6 fatty acids. Seaweed contains vitamins including A, B1, B3, B6, C, and E. It also contains minerals and trace elements including calcium, phosphorous, magnesium, sodium, potassium, iron, zinc, copper, manganese, selenium, molybdenum, chromium, fluoride, and iodine. Potential health benefits of seaweed: maintaining healthy cholesterol levels; may reduce risk of cardiovascular disease; weight management; supporting thyroid function; may be protective against some forms of cancer; and more! How much should you eat to maximize the health benefits? Since seaweed is extremely nutrient dense, you only need to consume small quantities to reap the benefits. For the average adult the recommended daily intake is 0.2 to 0.35 oz or 5 to 10 g of dried seaweed. If you plan on using seaweed therapeutically, please consult with a medical professional. Although it may be tempting, do not harvest wild seaweed yourself. Proper harvesting techniques are essential in maintaining the health of the plant and its surrounding environment. You can purchase seaweed in most natural food stores, Asian grocers, and sometimes even in well stocked grocery chains. If possible, choose sustainably sourced and traceable seaweed. Seaweeds are know for their salty, briny and distinctive umami flavour. Depending on the variety, it can be enjoyed dried or fresh, roasted, cooked, stir-fried, marinated, used in teas, soup stocks or bouillons, dips and spreads, used as garnish or salt replacement, and as a thickening agent. It's highly uncommon to find fresh seaweed in North America. Depending on the type of seaweed you're cooking with you may need to rehydrate it by submerging it in water before use. Although the options are endless, here are a few ways you can incorporate seaweed into your diet: wakame in miso soup; kombu in dashi or when cooking beans or grains (to increase digestibility & add nutrients); nori for sushi or toasted to make a crispy snack; agar agar (a gelatinous substance derived from algae) to make jams and jellies; or dulse sprinkled in salads soups, stews or pan fried to create a plant-based alternative to bacon; etc. Note: dried seaweed expands significantly when rehydrated, with an increase of 8 - 10 times in weight depending on the variety. If you're looking to add more seaweed to your diet, I have a few recipes on my blog that may be of interest to you. Check out my Dulse Sunflower Seed & Walnut Pâté, Superfood Kale Salad, and Kaiso Seaweed Salad (featuring hana tsunomata). You can also scroll down for my quick and easy miso mug recipe. This is one of my favourite snacks and I hope you'll enjoy it too! Bring water to a boil in a pot or a kettle. Transfer hot water, plus miso paste, to a mug or small bowl. Stir until the miso is dissolved. Then add in crumbled or small pieces of dulse and choose any of the add-ins listed above. Enjoy immediately! It makes a great mid-afternoon pick-me-up, or even a light meal with the addition of tofu. In the photo, I've added dulse, green onions, tofu, and mushrooms, and served the soup with a side of pretzel bites from Ottawa's zero waste grocery store Nu Grocery. 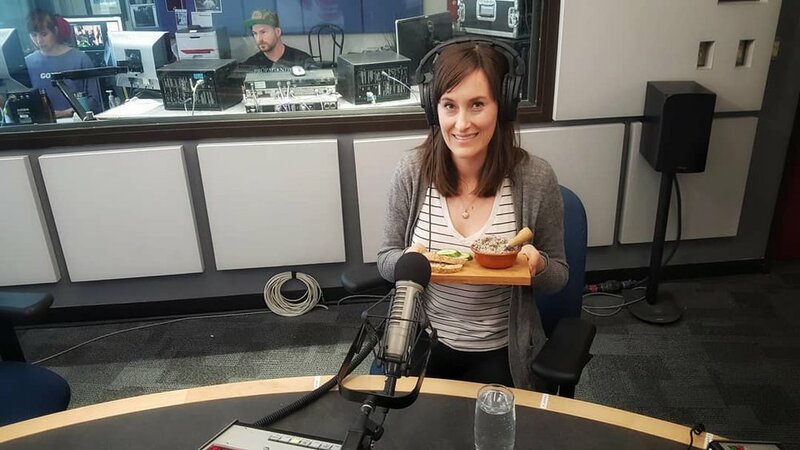 Last month I joined forces with my pals at Pure Kitchen, a vegan and vegetarian restaurant here in Ottawa, to create a delicious dish that would showcase their grab-n-go ranch dressing. I received tons of great feedback from people who've tried the recipe and I'm excited to share it with you! Scroll down to get the full scoop. Preheat your oven to 400 F. On a baking sheet, bake the sweet potatoes, whole, for about 30 minutes, or until soft enough to easily pierce the flesh with a fork. Cut the potatoes in half, length-wise, and let them cool slightly. Warm the olive oil over medium heat in a large skillet. Add the onions, chard stems and a big pinch of sea salt and sauté for a few minutes. When the onions are translucent, stir in the garlic and cook for a minute, then add the chard leaves. Cook for a minute or two, stirring frequently, until the chard is just softened, but not browned. Set aside in a bowl. Using a spoon, scoop the flesh of the potatoes, leaving enough for the skin to hold its boat shape. Put the scooped flesh into the bowl with the chard. Add the hemp hearts and mix thoroughly, and add salt and pepper to taste. Refill the sweet potato skins with the chard mixture. Bake for another 20 minutes, or until lightly browned on top. 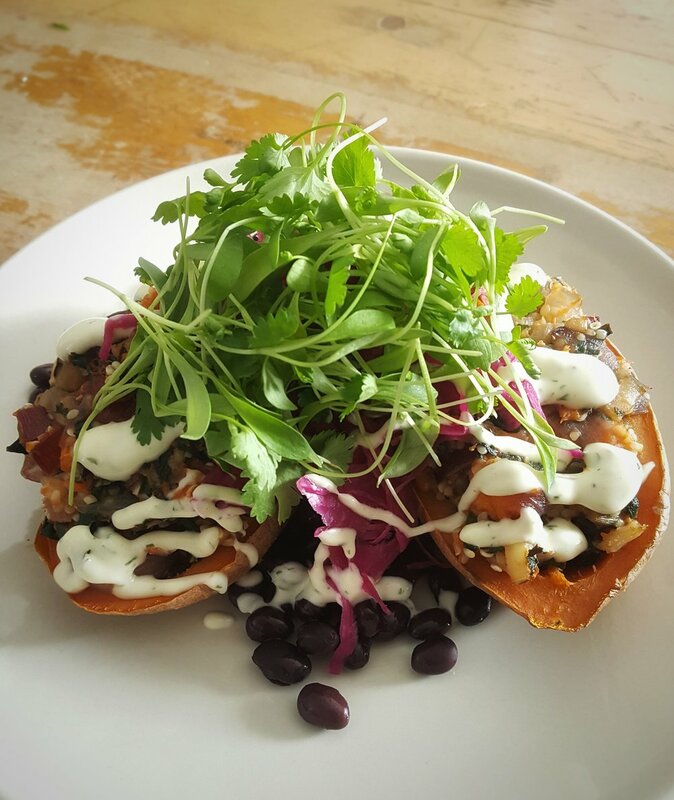 To serve: Add two sweet potato halves to a plate, sprinkle with approximately 1/3 cup beans, and garnish with sauerkraut and micro greens. Add a big drizzle of either the Pure Kitchen ranch dressing or a dressing of your choice. Enjoy! This is one of my top salads of all time and I couldn't be more excited to share it with you. Since so many of you have tried it and have asked me for the recipe, I figured it was time to share it with the masses. Based on that definition, it's safe to say that most whole plant foods could be considered superfoods! You don't need to travel to remote plains or depths of a tropical rainforest to find the healthiest of health foods. If you're looking to find superfoods, simply head on over to your nearest grocery store and b-line it to the produce section where pretty much everything could qualify as a "nutrient-rich food considered to be especially beneficial for health and well-being"! Simply put, readily available grocery store items like vegetables, fruits, and even nuts, seeds, beans, chickpeas, lentils and so on are, by definition, "superfoods". How exciting is that? With that in mind, I created a salad featuring some of the most nutrient-rich foods (both land and sea) that we can find here in Canada, put them together, and topped them with a delicious dressing. If you break it down this salad is just bursting with nutritious properties like antioxidants, phytochemicals, fibre, probiotics, fatty acids, plant protein, and much much more. Plus, it's also super flavourful! By the way, if you're a newbie to seaweeds, don't be intimidated. Hana tsunomata is a mild seaweed that can easily be added into any dish. It's not overpowering and doesn't have a strong sea taste or smell like some other varieties. If you're in Nova Scotia, Prince Edward Island, or Ottawa (Ontario), you can find hana tsnuomata in retail locations. However, if you're outside of these areas you'll need to order it online from Mermaid Fare. If you don't have seaweed and you'd like to make this salad right away, you can either swap out the hana tsnunomata for other varieties of seaweeds (rehydrated wakame or sliced nori sheets would work), or you can simply omit it altogether and it'll still be tasty. Ok, let's get this salad party started. Scroll down for the full recipe. For the salad: Add the sliced kale to a large bowl and drizzle with a little bit of olive oil, add a splash of apple cider vinegar, and a pinch of sea salt. Using your hands, squeeze and massage the kale leaves. You’ll do this for 2 or 3 minutes until the leaves start to soften. This will make the kale easier to chew and more palatable. Once the kale is soft, add the cabbage, and carrot to the bowl. To make the dressing: Using a fork or a whisk, combine apple cider vinegar, dijon mustard, and maple syrup in a bowl or medium sized measuring cup. Slowly pour in 5 tablespoons of extra virgin olive oil and whisk, or stir, until thoroughly emulsified, then mix in sea salt and cracked black pepper to taste. To assemble the salad: Drizzle the dressing over the kale, cabbage, carrot and hana tsunomata (if using). Mix the salad well to ensure that the vegetables are evenly coated. Add the hemp hearts and toss again. Serve immediately and top with as much sauerkraut as you'd like.